Tasty and easy appetizer -- serve with crackers! Pam or Canola spray a serving dish. Heat the soup then add and dissolve gelatin in a saucepan, heating until hot and bubbly. Stir well to make sure the gelatin is completely dissolved and there are no lumps. 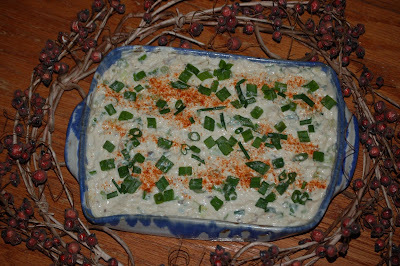 Place and mix right in serving dish, adding the cream cheese first so it melts, crabmeat, celery, green onions, lemon juice and cayenne, if so desired. Stir gently but thoroughly. Smooth the top with a spatula or knife. I sprinkle on more green onions and some cayenne for color! Cover with plastic wrap. Transfer to the refrigerator and chill until firm, about 3 to 6 hours. When ready to serve, remove the plastic wrap and loosen the edges of the mousse by running a knife around the sides.